Tyler Curtis Richards, Jr., of Manheim Twp., PA, entered into the presence of our Lord on March 29, 2019, with family members at his side. He is reunited with Evelyn, his wife of 66 years, who preceded him in 2015. Tyler (“Buddy”) was born on March 2, 1929, in Orange, NJ, and grew up in Maplewood, NJ. He graduated from Columbia High School, Maplewood, where he met the love of his life, Evelyn, and they married on Nov. 6, 1948. After having five children, they bought their first home in South Orange in 1960 and lived there forty-two years. They retired to Landisville, PA in 2002 where they ministered to neighbors and friends at Calvary Church for 13 years. Tyler worked for 15 years at Bell Telephone in Newark, NJ, as an installer and lineman. During this time, he earned a B.S. in Mathematics from Rutgers University after attending night school for 10 years. After receiving his state teaching certification, he accepted a position to teach mathematics and electronics at Essex County Vocational-Technical School in Irvington, NJ. A lifelong learner, he continued his education at Montclair State University, earning his M.A. in Educational Administration and principal certification. His unquenchable desire to learn and understand how things work was contagious and impacted his students, children, and all who came to know him. Tyler retired from teaching in 1993. Tyler and Evelyn came to a saving knowledge of Jesus Christ in the 1960s, which sustained them through the loss of their son, Gordon, in 1971. Tyler was a loyal, hard-working family man and loving husband, with a wonderful sense of humor. He constantly shared with others the blessing that God had given him when he married Evelyn and was a shining example in the faithfulness and love he displayed for her. Tyler is survived by his children and spouses, Tyler Curtis III (Peggy) of Fort Wayne, IN, Holly Orgo (Joseph) of Brielle, NJ, Christian Fredrick (Kimberly) of Morris Plains, NJ, and Caryl Roper (Scott) of Lititz, PA; 13 grandchildren and 9 great-grandchildren; and his sisters, Virginia Wiedmann of NC and Joanne Beatty of PA. In addition to his parents, wife, and son, Tyler was preceded in death by his siblings Eleanor Knox and John Richards. 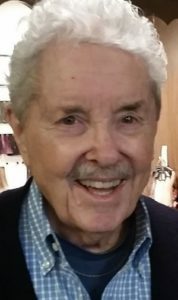 A funeral service will be held at 12:00 p.m. on Friday, April 5, 2019, at Calvary Church, 1051 Landis Valley Rd., Lancaster, PA, with Dave Scott, a dear family friend, officiating. Friends and family will be received at the church from 10:30 to 11:45 a.m. on Friday. Private burial will be in Bloomfield Cemetery, Bloomfield, NJ. In lieu of flowers, contributions in Tyler’s honor may be made to Market Street Mission, a ministry to the homeless and helpless where Tyler served after retirement, 9 Market Street, Morristown, NJ, 07960. To the family of MR. Richards, please accept my sincere sorrow at his passing. I knew him a long time ago, when he was my electrical science teacher. He always had a sharp wit about him, all the guys liked him, and used to try to match his jokes. I know he will be greatly missed. May he Rest In Peace. Norman c. Slater Irvington Tech. Class of 71. I spent over 12 years in the late 50’s and 60’s as a camper and then counselor at Camp Nendawen, a YMCA overnight camp for underprivileged children. I’ve tried to live my life and raise my own family by some of the roles models I experienced at camp. Ty Richards was one of the best! “Uncle Ty” was the Camp Nendawen program director for years, his son Kurt was a counselor and son Gordy was camper with me. As the product of a broken home myself, I loved and idolized his family. I eventually married and raised my own 3 daughters with the fatherly guidance, love and unconditional support that I learned from Uncle Ty. I am a better person today because of him. A bit of a humorist myself, I was no match for the quick wit and charmed sense of humor of Ty Richards, he will be missed. On behalf of the Camp Nendawen alumni, god bless Ty and Gordy and our condolences to the Richards family. To all the family members and friends of Ty. We were friends for many years ,who got to know Ty and Evelyn other well via the generations ABF of Calvary Church in Lancaster ,PA.
TY was a great example of a faithful and interesting man,and we always enjoyed meeting and talking to him. We extend our condolesances to you all ,but know that he is in a great place ,back together with Evelyn next to Jesus.